I don’t know why, but it really bothers me when my little boy bolts out the back door stepping around and jumping over the various arrays of toys just to head straight for the small and somewhat insignificant dirt pile near our patio. By the time his session in the dirt has ended, he is covered from head to toe with it. His bright blonde hair shows every spec. We usually head straight to the bathtub for a nice scrub down. After his bath, you would never know he was covered in dirt from his time outside. I usually will say to him “Please don’t get in the dirt. Mommy doesn’t want you to”. He replies with “okay”. However, he still heads straight out the door right for it. It is as if he is compelled to play in it! One day while watching him twirl his stubby little fingers through it, I got to wondering if God feels the same way at times about us playing in the dirt. He may not want us to, but yet, we go back to it time and time again. Or, perhaps He wants us to get a little dirty at times. It is quite possible that there are many life lessons that we have to learn while in the dirt in order to come out a little cleaner. As I grew from being an eleven-year-old to a young adult, I noticed more and more that despite trying to stay clear and clean of truly dealing with my hysterectomy and infertility, I found myself struggling to ignore it. I do not recall at what point exactly that I threw my hands up and gave up on pretending that my surgery did not bother me. Through the years I probably attempted this many times and may have succeeded in leading others to believe that I was just fine with all that happened. Truthfully, I was never okay with what happened to me. Looking back on my experience with infertility, I can say there were definitely moments that I was just moving dirt around from one place to the other. Sometimes I would just sit right in the middle of the squalor that is hopelessness. Other times, when seeing my friends and families enjoy their pregnancies, I felt compelled inside to sling mud around. I would never try to purposefully ruin someone’s moment, but internally, I was slinging the mud from one spot to the other because of despair, anger, and jealousy. There were times when my sense of purpose for life seemed to be soiled by the trauma of my surgery. Everything seemed to be less enjoyable because all I could do was wallow in my own misery. It was as if the impact of my surgery caused most things in life to be covered in a thin layer of dust; the debris left behind from just one impactful moment in my life. It was during these times when I had my hands and head in the dirt pile that I probably gained the most insight about my life and the Lord’s will for it. In order for me to get a to a place of contentment and hope, I had to really dig around and take a look at what kept popping out of the “mud”. I wish I could honestly say that I fully accepted being barren before becoming a mother to my children. I cannot do this though. While fostering them, I found myself still digging around trying to process and take it all in. There were moments when I grieved the fact that I didn’t carry them in my body. I would have never chosen some of the actions their birth mothers did. Other times, I was so frustrated because it only seemed “right” that I should be able to keep them and not worry about reunification…after all, I was doing all the hard work raising them. Being a foster parent definitely allowed me to discover the full impact of infertility. It was extremely hard at times. I never really knew what I was missing until I held my children for the first time. While I was overjoyed with loving them, I was also being reminded of the great loss I had suffered. There were other times when I became angry with myself for ever signing up to do foster care in the first place. When it seemed that their cases were heading towards reunification or placement with relatives, I would start grieving their loss before it even happened. I thought to myself “Well great job Caroline. You’ve lost having a biological child, and now you just set yourself up to lose the only babies you have been a mommy to.” There I was, playing in the dirt again. It seems now though that being in positions that truly forced me to get my hands and my head dirty probably were the most poignant times when I stretched in my understanding of what had happened, developed in my humility and empathy for others, and grew into a more faithful child of God. I lifted up these dirty hands, this soiled heart, and this dusty life to Him. As I did this my vision became cleaner; or better yet, His vision of me became clearer. 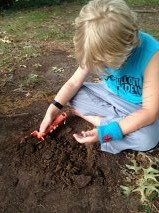 I have decided to make a consorted effort not to stress about my little boy playing in the dirt anymore. After all, it is just dirt. There are much worse things he could play in. I may just shock him one day and actually encourage him to get as dirty as he wants to. Who knows…I may just get out there and join him! I’m sure he probably is working out things while playing in the dirt! At the very least, his imagination is at work. He’s all boy – loves rocks, sticks, fishing, and, of course, dirt! Thanks for reading my blog and for the comment. Have a blessed day! I hope you do get out in the dirt with him. Just think of all the beautiful flowers and tasty veggies you can plant and watch grow with him! Thank you for your beautiful blog. We think a lot alike, and I think you may also enjoy my blog. It’s http://www.themuseisworking.com Have a blessed day. Thanks for reading my blog! I’ll check yours out! Blessings!